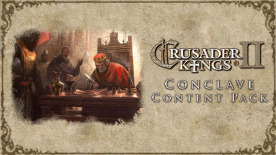 Conclave is the latest major expansion for Crusader Kings II, and its release is accompanied by a new Content Pack to bring the majesty and diversity of the Middle Ages to life on your computer. Conclave will give your vassals some bite, as the council that governs your realm will now demand some say in how you rule. Keep your council happy, and the mighty vassals will resist the pull of faction and civil war. Dismiss their interests, though, and you may find yourself trying to hold together a council at war with itself. There are also major changes to childhood education, laws, and marriage alliances.